Are you among the followers of Avalon Equine who can't wait to see what they're up to next? Wait no longer - the new Avalon Equine ad has been released and it doesn't disappoint! Avalon Equine has made a name for themselves in the world of breeding, primarily through their rock-solid commitment to honest dealings and quality horses. Their stallion lineup is impressive. For 2018 it includes not only their own range of excellent stallions, but several outside stallions as well, including the stallions of Silver Creek Farms. In recent years, however, they've also become recognized for their creative farm ads. Innovative, dramatic, and often a bit risqué, the ads reflect the owners' unusual style. Kathy St. Martin and Jos Mottershead seem determined to meet the challenges of the horse business with a sense of humor and a dash of daring. The World Breeders Federation for Sport Horses published their list of top breeding stallions for 2017. In dressage, De Niro (who died just last month) was the top-ranked sire, with Sandro Hit second (up from 3rd in 2016). Chacco Blue was first for jumpers, a big leap from 8th in 2016, while Diamant de Semilly went from 1st to second. Contendro was top sire among eventers, with Jaguar Mail moving up from 4th to 2nd. We have a wonderful son of De Niro in North America: the Elite stallion Devon Heir. Sternlicht is an exemplary grandson of Sandro Hit. For a show jumping son of Diamant de Semilly, check out Daxibus Normandy. Cornet Obolensky's is well-represented by grandson Coronet d'Honneur. Please post in the comments below any other stallions you find on WarmbloodStallionsNA.com by these top sires! 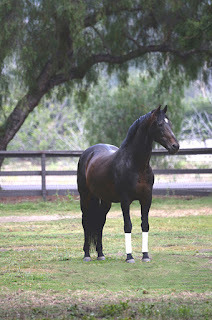 Click here to search on WarmbloodStallionsNA.com. Click here to see the top ten results, and you can also download a PDF with the full results from that page. For the eurodressage story on the passing of De Niro, click here. Devon, PA – Day 3 of Dressage at Devon featured more than 20 individual breed classes including the Alkal-Teke, Hanoverians (2 and under and 3 and older), Haflinger, Andalusian Horse, Dales Pony, Oldenburg (GOV), Paint Horse, Friesian, Danish Warmblood, Knabstrupper, Iberian Horse, ISR Oldenburg, Appaloosa, Irish Draught, Purebred Arabian, Half Arabian, Lusitano, KWPN NA, Drum Horse, Thoroughbred, American Saddlebred, Lipizzan, Georgian Grande, and PRE. Many of these breeds have shown at Devon for a number of years but, new this year, were the Dales Ponies, sponsored by the Dressage at Devon committee. The Dales Pony offers a combination of good conformation with energy and ability making them excellent for riding, driving and draft. They are unbeatable at a walk and have the stamina and determination to keep going over long distances according to the Dales Pony Society of America, Inc. Being willing and very clever jumpers, they compete very successfully in Cross Country Trials and performance classes. These ponies are very good at competition driving classes and can do well in dressage. Kathy Kiesel, Vice President of Facilities for Dressage at Devon, imported Bickerdike Cracker Jack (Canandale Great Expectation x Canadale Black Magic), the winner of the class, from Alberta, Canada in 2002 when he was one of only 60 Dales in North America. He was taught to drive, was her daughter’s mount in lead line, was a therapeutic pony for five years at Quest Therapeutics and, more recently, has been showing at first level and is schooling to third level. Kathy also owns Mighty Max (Raspotnik Conner x Bickerdike Midnight Jazz), the red ribbon winner in the class. She’s a big fan of these sturdy and reliable ponies. 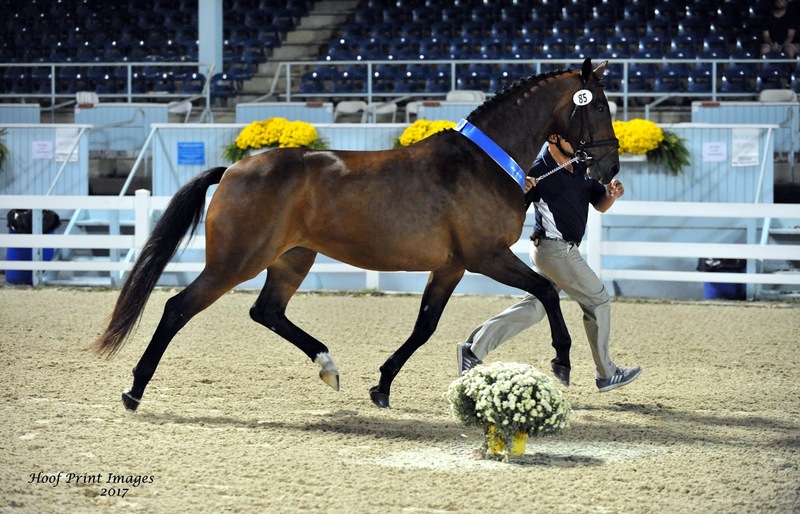 Robbie Kankus, CEO of Dressage at Devon, is now the owner of Bickerdike Midnight Jazz who was also entered in the class. The Dales Pony has been placed on the critically endangered list in Britain but Britain’s royalty is on board with the Queen often riding a Dales and HRH the Prince of Wales is a Patron. USEF Fourth Level Test of Choice Open GAIG/USDF Q – The blue ribbon went to Silva Martin on Jada W, a 16.1 Warmblood mare, with a score of 69.797. Jada W was bred and is owned by Windurra USA (Unionville, PA). The last class of the day was the USEF Fourth Level Test of Choice Open GAIG/USDF Q was won by Meagan Davis on Damocles HLF (Diamond Stud x High Society), owned by Meagan Davis. Complete results can be found at www.dressageatdevon.org. The Performance Division continues Friday, Saturday, and Sunday with classes including Intermediaire tests, the FEI Prix St. George, Grand Prix Qualifiers, and Grand Prix Musical Freestyles. Plus, on Sunday, Dressage at Devon’s unique Dressage Explorers program will take place and include a selfie scavenger hunt, equine jeapordy, make your own stick horse and a stick horse competition in the Dixon Oval. Plus, Explorers will have a chance to meet Silva Martin and learn the ins and outs of dressage competition. The sun is out and the forecast is great. Join us! Dressage at Devon takes place September 26 – October 1 at the Devon Horse Show Grounds in Devon, PA. General admission tickets are $10 for ages 13 and above; Kids ages 3-12 are $5, and children under 3 are admitted free. Reserved seating is $26 on Friday, $37 on Saturday and $10 on Sunday. Grand Prix 3-Day reserved seat ticket package is $66 and reserves an assigned seat for Friday, Saturday and Sunday. (Seat location may be different each day.) Reserved tickets are available online at www.dressageatdevon.org. General admission is available at the door. The largest open breed show in the world continued today with 4 and 5 year olds shown in-hand and under saddle in the Materiale classes. The USDFBC Mare Championship went to Andorra ISF (Sir Sinclair x Hivona), a 16.1, bay, 12-year old mare bred by Iron Spring Farm, Inc. (Coatesville, PA) with a score of 81.675. The USDFBC Stallion Championship went to Sandros Star (Sagnol x Nostalgias Tar), a 16.3 stallion bred by Vicki Bauer and owned by Hannah Salazar (Middleburg, VA) with a score of 77.325. It’s always great to see younger people entering Dressage. Devon Wallish with Armando SFI took the blue in the Youth Handler class with a score of 83.900. The Dressage at Devon Grand Champion ribbon went to Danae MF (Doctor Wendell MF x EM Rising Star), a 3-year- old Hanovarian bred by Maryanna Haymon, Marydell Farm, Columbus, NC and who was no stranger to the winner’s circle. “It’s been an amazing couple of days,” said Maryanna. When asked about Danae MF, Maryanna said the she’s been a quiet, trusting, affectionate horse from the beginning. 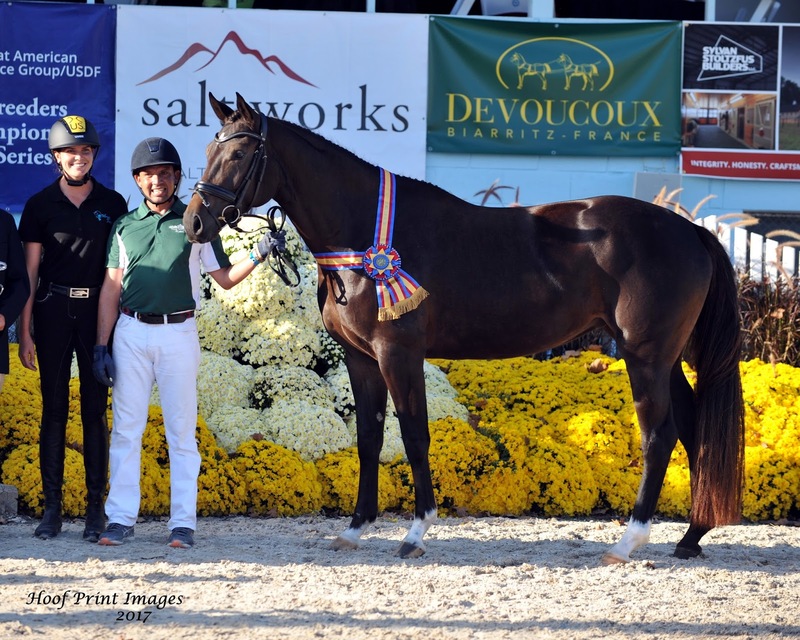 She’s a very accomplished 3-year old,” said Haymon, having won, among other honors, the USDF Traveling Trot Perpetual Trophy awarded to the highest scoring dressage Sport Horse In-Hand of all ages and both genders. Danae’s full siblings include Don Pharrell MF (winner of the Yearling Colts/Geldings) and second in the Young Horse Championship as well as other promising youngsters. Haymon breeds for Grand Prix qualities and can offer regional Grand Prix horses who are “safe, sane, and competitive,” CDI competitors, and then there are those who could make any Olympic team. She says horses bred in the U.S. meet or surpass the caliber of horses bred internationally. 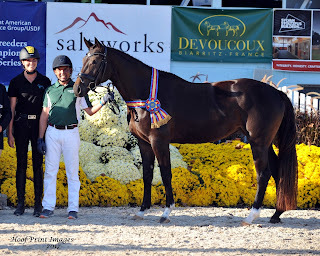 USDFBC Mare Champion Andorra ISF (Sir Sinclair x Hivona), bred by Iron Spring Farm, Inc.
USDFBC East Coast Foal Championship - Fleur de Niro (Furstenball x Dancing Darkness) a black filly bred and owned by Anke Ott Young, New Canaan, CT, with a score of 82.050. USDFBC East Coast Filly Championship – Kasina ISF (Uno Don Diego x Rabiola) bred and owned by Iron Spring Farm Inc. with a score of 80.675. USDFBC East Coast Colt and Gelding Championship – Stetson HTF (Sternlicht GGF x Unicum-d, bred and owned by Hilltop Farm Inc. (Colora, MD) with a score of 78.237. Colt/Gelding Championship – Don Pharrell MF (Doctor Wendell MF x EM Rising Star MF) bred and owned by Maryanna Haymon (Columbus, NC). USDFBC East Coast Final 3 year old Materiale Championship – Sole Fiore ((Scuderia x Francesa bred by Ferdinand Mayer and owned by Melinda Kelly (Hillard, OH) with a score of 78.150. The breed show continues Wednesday and Thursday four and five year old championships, mature horse championships, stallion and mare championships and the grand championship. Plus Materiale classes, Breeder’s Group, Handler classes and, on Thursday, the Individual Breed classes, from Alkal-Teke to PRE. “Not a great idea ..."
Had a stressful day? As taxing as it was, your anxiety was probably nothing compared to the stress foals experience during the weaning process. According to new research, weaning is one of the most stressful events in a horse’s life. • Weight loss, performance decline after weaning, and higher risk of infectious diseases. “Based on the study by Mach and colleagues, increased circulating stress hormones can negatively impact the gastrointestinal tract of foals during weaning. Specifically, those hormones could alter the intestinal microbiome, potentially allowing for overgrowth of harmful organisms such as Escherichia coli,” explained Kathleen Crandell, Ph.D., nutritionist at Kentucky Equine Research (KER). To read the full article, and related articles, click here. 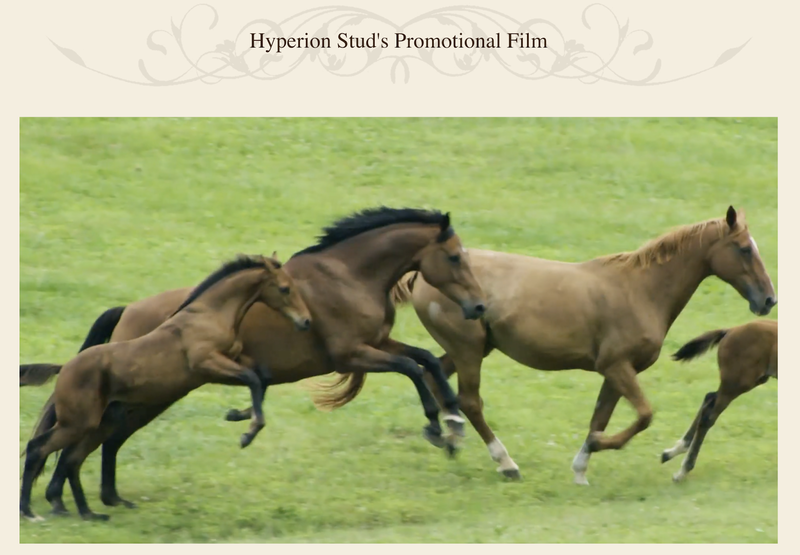 Hyperion Stud, LLC produced a lovely video of their farm, which was released this summer. The first in a series, this one introduces the guiding principles behind Hyperion. A beautiful farm, with stunning horses, Hyperion is well-filmed here, and the video is lovely to watch. We'd like to send special congratulations to Hilltop Farm and also to Patricia Becker and Dr. Anne Ramsay for their results in Friday's competition at the Markel/USEF Young & Developing Horse National Championships. Hilltop's Qredit (Quarterback-Dream Rubina, Dream of Glory) was ridden by Michael Bragdell, and Patty Becker rode Dr. Ramsay's home-bred Oldenburg stallion Freedom (Feuri-Windjammer, Walk on Top). The two shared second place in the Intermediate II test. Finery, owned by Anne Howard, took third in the 6-Year-Old Preliminary test. Wayne, Ill. - Aug. 25, 2017 - To begin the second day of competition at the Markel/USEF Young & Developing Horse National Championships at the Lamplight Equestrian Center, Cesar Parra of Whitehouse Station, New Jersey, came away with a win in the Intermediate II, which was the first test for the Developing Grand Prix division. Parra earned a 69.561 percent aboard his and Martha Sosnoff's 9-year-old Oldenburg gelding Fashion Designer OLD (Faustinus-Forst-Design, De Niro). Bred by Heike Kind in Germany, the gelding won the 5-Year-Old Young Horse National Championship in 2013 with Nadine Buberl. He returned to Lamplight in 2016 with Parra to earn the reserve championship title in the Developing Prix St. Georges division. 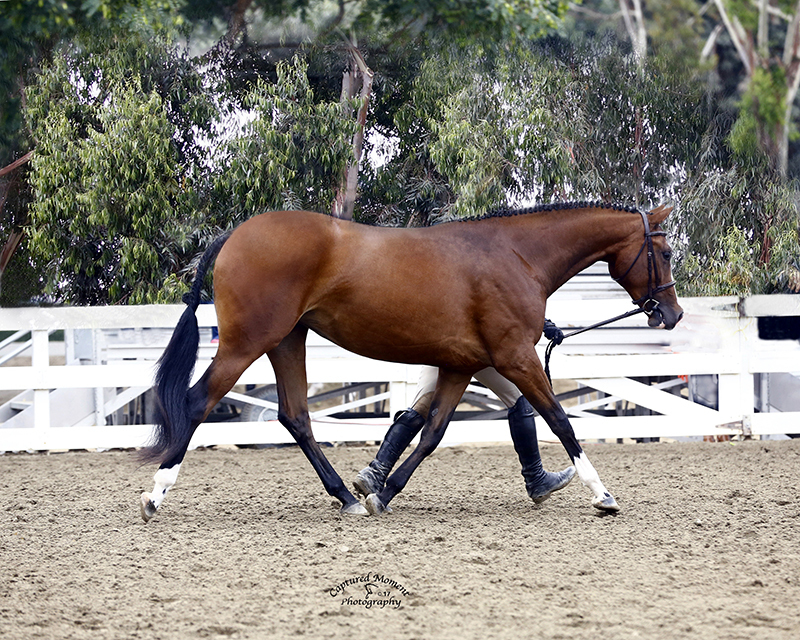 This year, the pair excelled in the Intermediate II test with highlights that included the trot half-passes, the canter pirouettes, and the piaffe and passage tour. Patricia Becker of Wadsworth, Illinois, and Michael Bragdell of Colora, Maryland, tied for second place in the Intermediate II test with a score of 67.325 percent. Becker competed Dr. Anne Ramsay's 10-year-old Oldenburg stallion Freedom (Feuri-Windjammer, Walk on Top). Bragdell rode Qredit Hilltop (Quarterback-Dream Rubina, Dream of Glory), a 9-year-old Oldenburg stallion owned by Hilltop Farms, Inc. In the 6-year-old division, Andrea Woodard traveled from Wellington, Florida, to top the leaderboard with a score of 7.9 on her Oldenburg mare Ravenna (Sir Donnerhall I-Romanze, Blue Hors Romanov). Ravenna was bred in Germany by Britta Luebbers and Woodard bought her as a 3-year-old. The pair received a trot score of 8.5 from the judges who rewarded the gait's cadence, and the judges gave an 8.0 for their general impression. Werner Van Der Brande, who lives in Royal Palm Beach, Florida, followed closely behind in second place during the 6-Year-Old Preliminary test with a 7.8 aboard Flyby FLF (Falsterbo-Whirliegirl, Wonderland), a Hanoverian stallion owned by Linda Sommers. Michael Bragdell earned the yellow ribbon with a 7.6 on Anne Howard's Oldenburg stallion, Finery (Furstenball-Sonetta, Diamond HIT). The Markel/USEF Young & Developing Horse National Championships continues Saturday, Aug. 26 with three championship titles being crowned: the Developing Prix St. Georges National Championship, and the 4-Year-Old and 5-Year-Old Young Horse National Championships. For results and starting times, visit www.foxvillage.com. For more information about Lamplight Equestrian Center, visit www.lamplightequestriancenter.com. Live streaming will be available on the USEF Network. "Freedom is a horse I've had since he was 3 and I rode him as a 5-year-old here. He's a wonderful horse to ride and is a stallion, and he can sometimes act like a stallion! As he's developed he puts his game face on more whenever we go in the ring. That's what he did today, but the mistakes were very small. I was very pleased with him and his effort and focus today. I love Lamplight - it's super close to me so I love to compete here." who owns him and Hilltop Farm. He has grown up on the farm since he was a weanling. I showed him as a yearling at Devon and he won in-hand. Through the years I've developed him, so to be here with these fierce competitors, Cesar and Patricia, it's a nice group to be in. I'm really proud of him." "I was quite thrilled with my horse. He is owned by Ann Howard and she trusted me to train and show him. I got him last spring and I think he is super talented and has progressed well. In the test, he gave his all. I have to give credit to my coach, Morten Thomsen, who has helped us along the way and has really made a big difference in the training."